But the problem is we don't have any organized place to store the tools , they are all over the place, part of them ware mounted on this wall , and the other are somewhere else. I decided to do some Building and solve this issue. Between the Clamps and the Bolt i rapped it with some fabric in order to keep the screw thread complete. In order to hang the tools, you can use two methods . Second one , with an iron wire ( in picture ) , cut it into small 8 cm pieces , drill a hole first and then Knock it in with a hammer. created two mounts, for the Soldering iron and the Hot glue..
Great and quite homey too ! Great Idea.I will making this very soon.Thanks very much i needed this desperatly. Nice good looking, well work out. I love this instructable. One of my first favorites. We bought a house over the summer that we've been remodeling and I'm finally almost ready to start on the garage, where I want to build a maker shed (workbench) and I hope to use many of the designs you have here. I love the idea of having my most commonly used tools right in front of me. 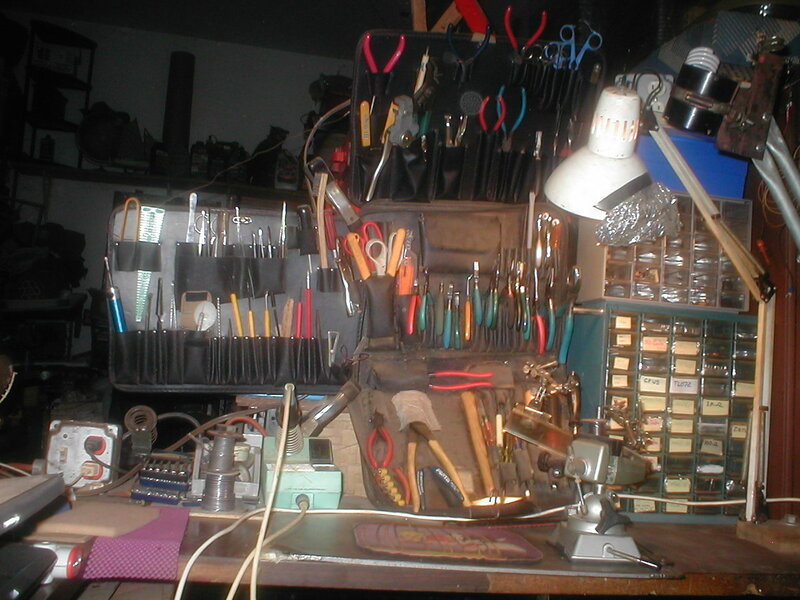 Since my garage wall is just a blank slate, I first need to put in a workbench. I'm thinking 39-42" tall will be best, perhaps 30" deep and 16' wide, with a 12" shelf about a foot above the surface. (I'm looking to do both electronics and woodworking.) The surface you started the instructable with looks great, with a smooth sturdy surface and cabinets below that come right up to the surface. Is that something you bought or built? And in either caes, can you provide any details? Thanks! Actually i built everything from Zero . i needed some help with a few parts since i don`t have all the knowledge to build everything.. I think that if i would have to change something then i would have given more thought on Lightning . I'm finally ready to start building your tool wall mounts. I ended up getting two 8' adjustable height workbenches (the Gladiator ones), one which I'll set at 42" for electronics and the other at 36" for woodworking. I hate the look of peg boards, so I'm hoping to copy your idea and just screw boards directly to the wall above the benches and then mount all the tools and bits like you did. A few more questions: How thick is the iron wire you use to hang all the tools, and what keeps it from falling out? I think you cut short 8cm pieces, then drill a hole (what size? ), then hammer half of it into the wood, and bend the remaining exposed half into a hook to hold each tool? Why doesn't the wire pull out of the hole when you hang a tool up? Is it tied or connected to anything on the back side? Speaking of backside, what is the purpose of the wall spacers? Does your back wall make it impossible to mount the boards directly to it? In my case, they are just going into drywall in a garage with 2x4 wood studs behind them, so I figure I can just buy 1"x12"x12' boards and drill them directly into the studs. Or is it better to leave a gap between the wall and the boards of your tool mount for your metal wire technique? Thanks again for the great idea and any advice. I drilled a 3.5mm hole inside the board , and pushed the iron wire with force , that way it wont pop out . It`s not connected to anything in it`s back , the only thing that keeps it in it`s place is the pressure .- don`t forget to drill a bit smaller hole than the iron wire. If you wont leave space behind that the only option for is to drill a hole as deep as your wood thickness.. Either way , i do sure that you will succeed in your work! very good. those it always gets me how you European folks have to work over the bathroom or kitchen to get a workspace (yes, I know: it may not be that, but it looks that way). great ingenuity in making this setup. 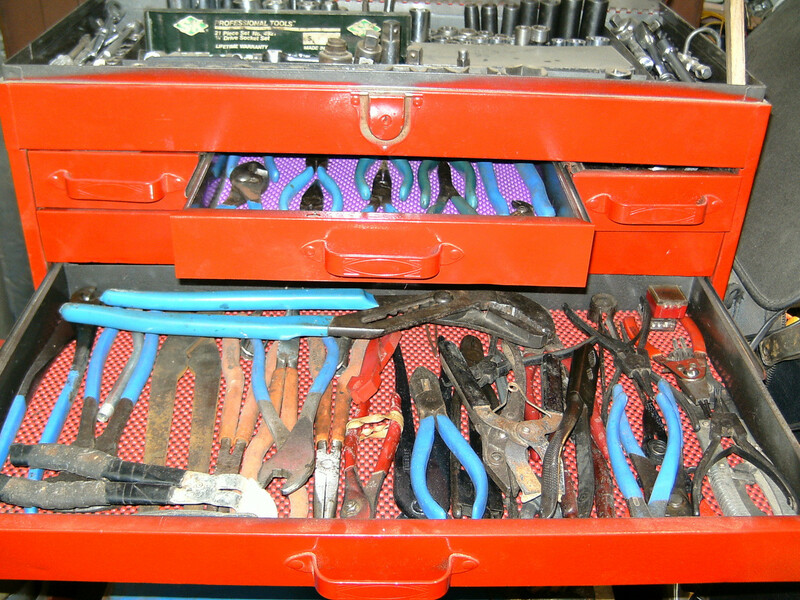 Nice job--need something like this to better organize tools in my shop. If you left narrow spaces [maybe 6 or 13 mm] between each of the back boards, could you design a way to hang re-positionable [sliding and removable] tool holders which would hang over the slots, especially small trays for small items that you might need to carry elsewhere briefly? [Sort of akin to what I see in stores here for displaying shoes on adjustable, slotted back supports.] In fact, when I first saw your photo of laying out the backboards, I hoped you were going to do that so I could benefit from your experience! Good job--enjoying your multiple projects! nice work. i would give the steel tools closest to the sink a wipe-down with some paste wax or a light oil to prevent any long-term surface oxidation because of humidity from the sink. good work! DO IT ! 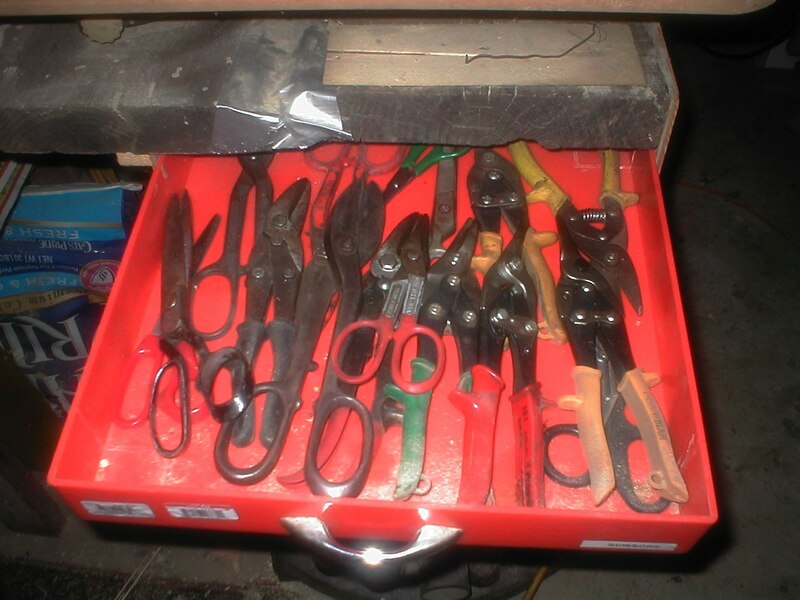 , don`t waste any time , it`s a great arrangement for your tools! 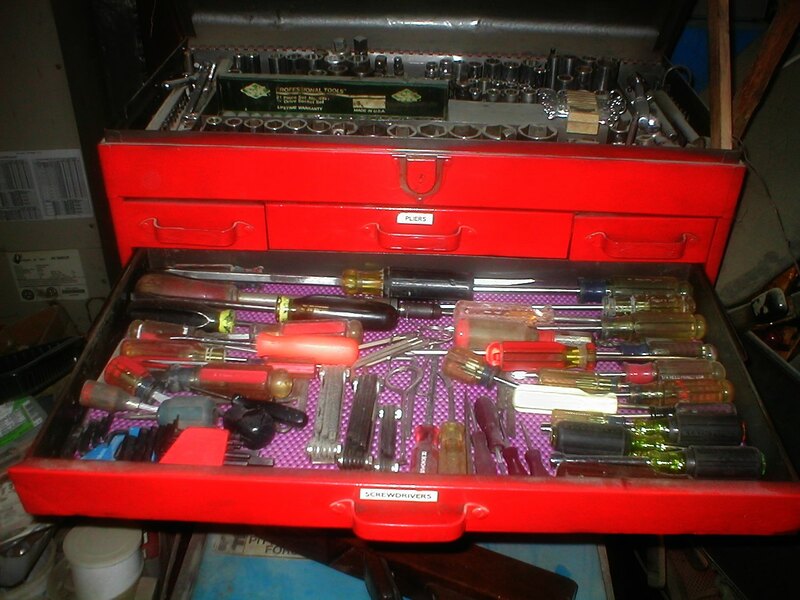 I'm a big proponent of keeping my precious tools in my drawers when not in use though. Some things don't scale well. One thing you can do as you get more tools is make hinged tool panels. They are kind of like a Rollo-Dex. Other than that it is tough to beat the density that tool chests allow. Almost all of my available wall space is covered with shelving, which is valuable storage itself. Plus many things I do generate lots of dust. Tool with dust left on them tend to rust in my climate. If I had to dust all of my tools off all of the time I'd give up! So I'm not entirely consistent. I end up polishing those more than I'd care to admit. I think the effort shines through though. I keep my tool in my drawers unless you have a nice chest...haha..oh me. Seriously though...simple, straightforward...and started this instructable last night. Thank You for making this so easy!! I was looking for a way to install some thing other than peg board...and bam... there you are. Thanks again man! I have also seen your instructable : "Simple Cheap Air Conditioner "